“You think we need spray skirts today?” I asked my paddling partner as we carried gear down to the water. I am a northern paddler, plying the border waters of the Great Lakes during the seasons between the ice sheets. In my usual kayaking climes, I seldom paddle open waters without a drysuit and thermal underthings, I have lain in my sleeping bag and felt the ground tremble as woodland caribou passed through my campsite, and early mornings sometimes reveal deck fittings encased in ice. So the chance to paddle in a southern-style bayou, normally found hundreds of miles down Dixie way, was too tempting to pass up. Ironically, I first learned of this quiet, primeval refuge a few years ago in the heart of a bustling metropolis, during a visit to Chicago’s Shedd Aquarium. 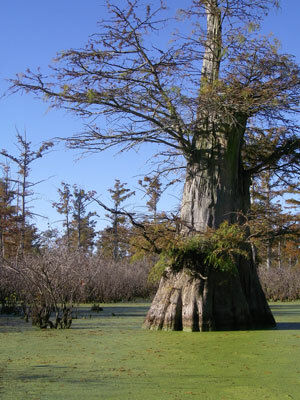 There, amongst the exhibits and marine tanks showcasing sea life from all the world’s oceans, was an intriguing underwater re-creation of North America’s northernmost cypress & tupelo swamp, located just a few hours away, in southern Illinois. 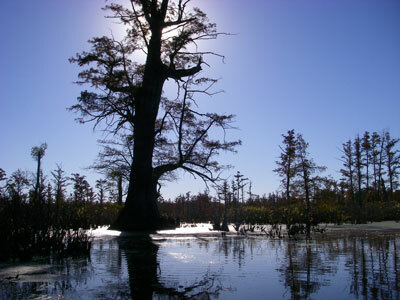 My middle-aged nose pressed to the glass like one of the many schoolboys there that day, watching channel catfish, needlenose gar, and turtles lurking about the gloomy underwater cathedrals of the cypress roots, I resolved to paddle there someday. So, with a spare day left on another nearby paddling trip, my travelling partner and I took the opportunity to explore this unique and shadowy bottomland forest. At the put-in, the wraith-like tendrils of mist hanging over the swamp soon fled the rising sun and scattered ahead of us as we slid our kayaks into the water and began paddling into the floating forest. We glided amongst the massive cypress trees, their wide, flared bases—called buttresses—emerging from the tannin-stained waters and converging to rise high overhead. Many of the towering trees in this preserve are more than a thousand years old, and were already five centuries old when Columbus first set foot on this continent. A great blue heron rose at our approach and winged away between the towering cypress trunks. In the main channels, the water is tinged a golden-brown color by tannins from the trees, and by the activity of lively submarine organisms and the processes of decay. In other places, the quiet backwaters are carpeted with a vibrant green duckweed. A valuable high-protein food source for waterfowl, duckweed is easy to paddle through, and is an important natural water purifier, growing rapidly and absorbing excess mineral nutrients, particularly nitrogen and phosphates. Named Cache, or hiding place, by the early French Voyageurs who explored this river, it is easy to see how a wayward traveller might get lost here. There are few clearly defined channels or banks to follow or to lend a sense of direction, and the seemingly endless groves of cypress stretch on in all directions. But the canoe trail is now well marked, and we easily followed the unobtrusive markers south- and westward, threading our way between the towering tree trunks and beneath their overarching crowns. Paddlers can follow the trail on jaunts of anywhere from three to six miles in length, offering a pleasant half-day trip on mellow waters. A handful of painted turtles slipped from their sunning log and plopped noisily into the tea-colored waters. Waterfowl is abundant here, and we saw great egrets, red-headed woodpeckers, and turkey vultures. Other birds that make their homes or migrate through here include little blue herons, green herons, least bitterns, wood ducks, mallards, snow geese, sora rails, woodcock, quail, mourning doves, pileated woodpeckers, prothonotary warblers, and black vultures. In addition, the woods are alive with white-tailed deer, raccoons, beavers, gray and red fox, opossums, and mink. More rare are the river otters, bobcats or Indiana bats, though several varieties of frogs sang from the tree canopies and river banks. We’re told the area also harbors copperhead, cottonmouth, and timber rattlers, but alas, no alligators. 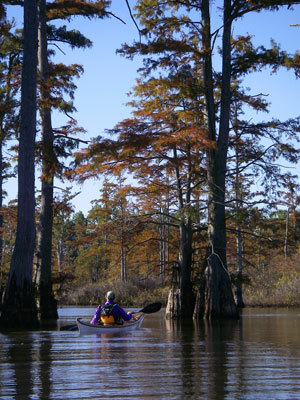 As we reached the west end of the canoe trail, we shimmied our kayaks single-file up a narrow passage through a thicket of brush, emerging on the other side in a beautiful glade of open water ringed by stately cypress columns. Wispy threads of moss dangled from the branches and waved on the quiet breeze. It was an intimate and magical place, accessible only by paddle, and I might not have been surprised to see a beckoning mermaid, or perhaps a majestic griffin sunning itself in a high cypress crown. 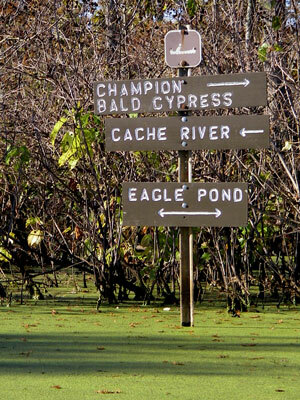 Before embarking on your own paddle exploration of the Lower Cache River Canoe Trail, you may wish to familiarize yourself with your surroundings, and the best place for that is the Barkhausen-Cache River Wetlands Center. From Vienna, IL, go west 5 miles on Route 146 from the intersection of Rt. 146 & US Rt. 45. Turn left (south) on Rt. 37, then proceed 9 miles to the Wetlands Center entrance. Here you’ll find exhibits and displays about the geological and environmental story of the Lower Cache River basin, dating back to prehistory, and enhancing your impending paddle there. From Vienna, IL, go west 5 miles on Route 146 from the intersection of Rt. 146 & US Rt. 45. Turn left (south) on Rt. 37, proceed 9 miles and turn right onto Perks Road. Continue west 1 mile and turn left onto Access Road; continue south .5 miles to the parking area with restrooms and boat launch. 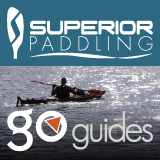 Jeffrey Lee paddles and writes in the Upper Great Lakes region. I am planning on kayaking this next weekend. Is there a map I can get of the river? Is there a put in and a take out area that we will need to do a shuttle. Or does one put in and take out at the same point? Yes, as I recall, the Visitors Center had maps of the hiking trails and waterways. This is a good place to stop before setting out, and they can provide up-to-date info for your day trip.